Capital Airport Group staff who recently attended a BreastScreen ACT clinic as a team. Photo: Supplied. Getting a breast check can be daunting for a woman, but the moral support to be drawn from a group mammogram booking can take the edge off the experience. 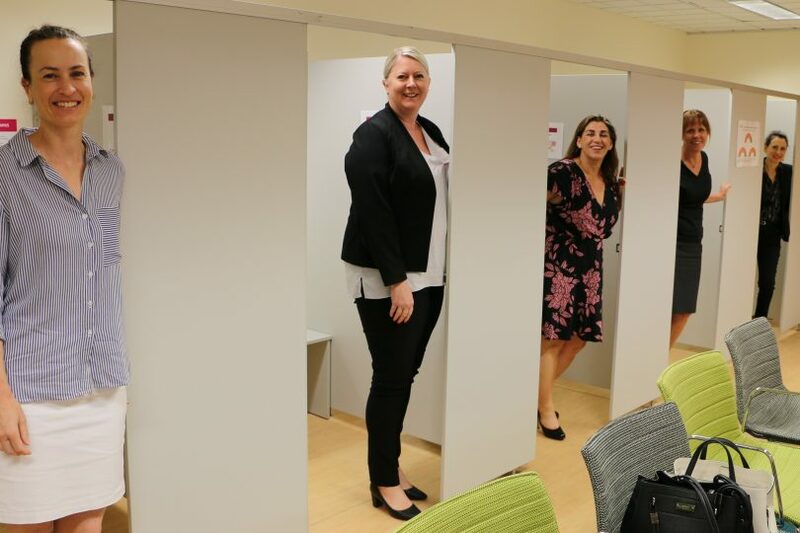 BreastScreen ACT is encouraging Canberra women to make group bookings with friends or workplace colleagues, after the recent success of a major Canberra employer organising a staff booking. The Director of BreastScreen ACT, Yvonne Epping, said group bookings were a good option for women who were nervous about having a mammogram, or simply wanted support and companionship before and after the test. “Group bookings are a great way to get together with friends or colleagues and do something positive and preventative for yourselves,” Ms Epping said. BreastScreen ACT is particularly encouraging employers to support their staff to get a mammogram and come as a workplace group booking. Capital Airport Group (CAG) has done just that, recently organising a group booking with BreastScreen ACT for its staff. Manager of Human Resources at CAG, Leesa Baker said staff were offered the opportunity to have a mammogram during work time to make it easy for them in their busy lives and to encourage them to look after their health. One of the staff who participated, Stacey, said the CAG group booking motivated her to get a mammogram. BreastScreen ACT mammograms are available to all ACT resident women aged 40 or over. There is no cost for the test, which takes only a few minutes. Ms Epping said women aged 50 -74 years should have a mammogram every two years. To make an appointment, call 13 20 50. Meetings, mung beans and the mountain pose.